Osteoporotic vertebral fractures are quite common in the population and are mainly due to osteoporosis. The problem is that almost 2/3 of these fractures remain undiagnosed and are attributed to pain caused by muscle spasms or spondyloarthritis related to ageing. They are more frequent in women after menopause, mainly in the more advanced ages, but they may occur at even younger ages (between 40 and 50 years old). Vertebral fractures due to osteoporosis may even occur with movements causing slight burdening or injury of the spine, such as stretching to close a window, light fall or rotation while lifting some weight. In cases of advanced osteoporosis, such fractures may also occur spontaneously. The vertebral body fracture due to osteoporosis is entitled “compression fracture”, with vertebra losing 15-20% of its height. The compression occurs at the anterior part of the vertebral body and the vertebra takes a sphenoid form. The posterior part of the vertebra usually does not undergo deformity and exerts no pressure either to the spinal cord or to the nerve roots. 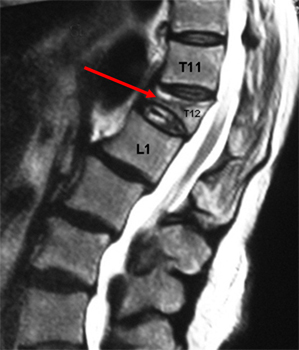 Fractures usually occur at the lower thoracic spine (T10-T12) and very rarely above the T7 level. They may also occur at the upper lumbar spine, mainly L1 and L2. The osteoporotic vertebral fractures cause a sudden, acute, intense pain which is aggravated even with the slightest movement and is located at the centre of the spine, approximately at the level of the fracture, potentially radiating along the sides of the body. The pain is usually resistant to the common analgesic regimen and persists for a very long time due to the concomitant oedema in the vertebral body. Should the diagnosis and treatment delay for more than 4-6 weeks after the event, the pain becomes milder transforming into chronic pain and, in this case, prolonged immobilization leads to deformity of the spine, loss of height, kyphosis, compression of intra-abdominal organs, loss of muscle mass and decline of the aerobic ability. These patients, who are usually elderly, receive anti-inflammatory drugs and other analgesics for a long period of time for pain relief. Due to inevitable immobilisation, they present complications from the cardiovascular system (hypertension, oedemas, heart failure, phlebothrombosis, embolism), respiratory system (atelectasias, respiratory failure) and gastrointestinal system (haemorrhage, perforation), with even an increased risk of death. The diagnosis is based on the history, clinical examination and radiological evaluation. Every patient over 45 years old having a history of osteoporosis with a sudden onset of intense pain in the back or low back persisting for more than 3-4 days after taking anti-inflammatory drugs/ analgesics, should be suspected for compression fracture and should have extensive workup until proven otherwise. The typical clinical sign is the intense tenderness upon pressure of the spinous process of the suspected vertebra. 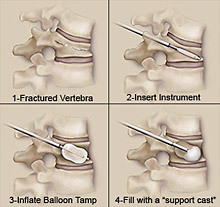 Although most bone fractures are revealed with plain X-rays, this does not usually happen with vertebral body fractures. The diagnosis can be made when the loss of vertebral height and its sphenoid deformity are demonstrated in the X-ray. However, if this specific examination is conducted in an early phase when the vertebra has not yet been significantly deformed, the diagnosis may be missed. If the fracture is not revealed with plain X-ray, then should follow an MRI, which sets the diagnosis of compression fracture revealing also bone oedema and determining in this way the chronicity of the fracture. The osteoporotic vertebral fracture should always be differentially diagnosed from a potential malignancy which may have metastasized to the spine. The patients should be investigated for cancer and multiple, particularly in those presenting hypercalcemia, unexplained anaemia, weight loss and proteinurea. The conservative treatment includes simple analgesics and anti-inflammatory drugs (to counteract the oedema and acute pain), gradual mobilization and special body support belt. Radiofrequency Neurolysis of the rami communicans in the sympathetic chain bilateral to the fractured vertebra.